It’s probably something that millions of others have pondered. Why do we allow politicians to lie to us? Time after time politicians look us in the eye. In person. On national TV. They look at us. They calculate. That calculation includes the prediction that come election day, we, the American public, will forget and forgive. Sequestration did not originate with the White House. It seems that no President in my life time has been truthful with the American Public. They take for granted that we will forgive them their trespasses. Why? Why do we forgive them when they constantly lie to us. The Patriot Act and Obamacare are two examples of Stalinistic BIG LIES that have forever altered the lives of millions of American citizens. The War on Drugs has ruined lives in the multitudes. Yet, it is based upon a carefully packaged set of lies designed wholly and from the outset to deceive the American public. The office of the President and the various offices of Congress are supposed to be servants of the people. How can these people serve us if they feel that they must constantly lie to us. FOR OUR OWN GOOD! As if we are all too stupid to understand. Now, it is a given that some of us are too ignorant. Too superstitious. Too uneducated. By and large, this is a product of the systems emplaced by that very Congress and the lesser State Congresses. No Child Left Behind is an example of the heinous programs set upon us by the Federal Government when it has usurped the power of the States and encroached upon the power of the people. This worthless act nearly guarantees that children will, educationally speaking, be left behind. It forces teachers and administrators to teach to a test. It stifles learning and critical thinking. It solved nothing but, instead, added a new layer of bureaucracy upon many more stale layers of bureaucracy that had been laid in the decades preceding. No Child Left Behind is a lie. VAWA is another lie. The Violence Against Women Act originated by Bill Clinton. It is a bill crafted to give monies to certain organizations that support the Democratic National Party. It is a terrible example of cronyism and the spoils system. It solves nothing and adds layers of bureaucracy to a bureaucracy laden system. It inculcates a notion of guilty until proven innocent into our “justice” system. Under this bill, thousands are treated as if they are guilty, they’re rights abused simply because a woman accuses a man. That man must not be found guilty to have his life destroyed. If the man is found to be innocent of the charges arrayed against him, it is too late. He has already been violated. This is VAWA. This is Bill Clinton and Barack Obama’s vision of justice. Guilty until proven innocent. It is almost Islamic in it’s outlook. Shariah law writ large upon the American justice system. If a woman becomes angered at a man because he cheated on her or if they argue over finances, that woman can scream “domestic abuse.” Her victim, for he is a victim in these cases, is forever stained and forever scarred by the system put in place by VAWA. I have seen it in action. This is no theory. A woman beats a man. That man defends himself merely by holding up his arms and then grabbing the woman to stop her from hitting him with a whiskey bottle. The police are called in. The man is taken away in hand cuffs for defending himself. The woman is left free to terrorize others. This man was then demonized by others who did not know the truth. The pity of it was that he loved her and could not bring himself to do the right thing and leave her. He was arrested several times over the course of two years until he was finally able to make the decision to leave her. They had children. The courts, not being able to fully believe that a man could be a victim and that the woman could be the perpetrator, awarded full custody to the alcoholic mother. This is VAWA in action. This is the BIG LIE that the Left tells us when they pass laws such as VAWA. The left has victimitis. 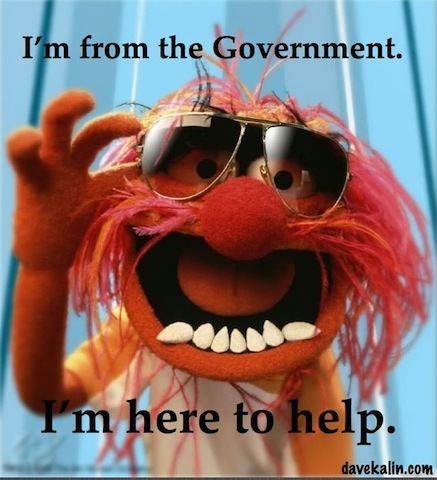 They feel that the only cure is more government or, rather, more Federal Government. Which leads us to another political lie told by both Republicans and Democrats. They rip the Constitution to threads and tell us that it is for our own good. They usurp powers from the State in the name of Security, Health and Welfare. Ronald Reagan was the Great Communicator. He was also a great liar. When he wanted the States to pass legislation placing the age of consumption of Alcohol to 21 from 18 years, Reagan pushed the States to pass those laws. This was in keeping with his State’s Rights Small Government stance. However, what he did not advertise was that he bullied the States into passing his legislation. Men can be sent off to war at age 18. However, they are not to be trusted with the consumption of alcohol. This was a Reagan policy. The man of the people. In order to force the State Legislatures to pass his Alcohol Consumption law, Reagan threatened to withhold interstate highway funds from all States that did not pass his law. Reagan. Not so States Rights oriented when he wanted to get his way. The way of the tyrant. The spoiled brat who will get his way or else. Reagan was also the author of the Iran-Contra Affair. I find it hard to believe that a President did not know of a program of such possible detriment to his administration. I believe that Reagan lied here as well. Bush probably lied about it as well. They let Ollie North be their fall guy and they paid him well for it. There are more examples of our government and their perpetual lies. 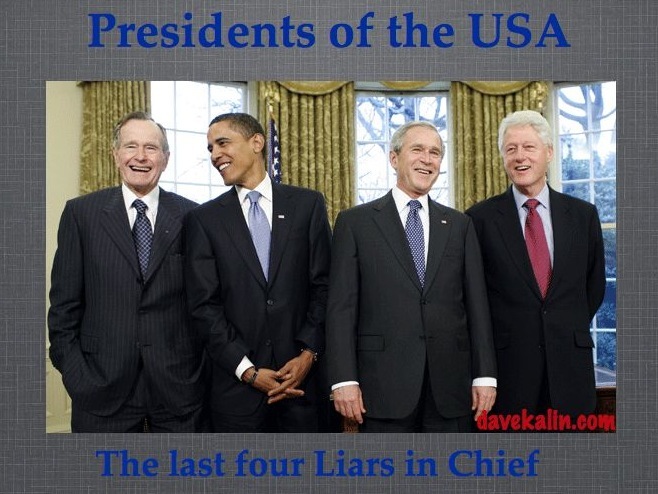 All Presidents lie to us. Regardless of their party affiliation. Only fools believe that one party is more or less guilty than the other. The question is: When will be begin to hold these Parties and their Candidates accountable for their words and deeds? I believe that Presidents should be liable for their actions up to their deaths. When scandals arise, apolitical action should be taken. If George Bush knowingly lied about WMD, let him be judged. If Obama lied about Benghazi or his Mexican Drug Gun deals, let him pay the price. Let them all be judged. We need to set a precedent. The precedent needs to be set for the good of the country. Not for the good of a political party. Presidential ties to organizations such as Goldman Sachs should be carefully investigated. Any and all Presidents with too close ties to Goldman Sachs and who have profited off of their scandalous deals and their corruption should be tried in open hearing before the public. A message needs to be sent. We will no longer excuse your lies. Give us the truth or we will give you your just desserts. Wishful thinking, I know. The general public is addicted to US Weekly, the Kardashians, The Voice and Survivor. What is the health of the Republic compared to being brainlessly entertained by celebrities?